Law enforcement officers check out a boat loaded with illegal drugs. A San Mateo County Sheriff's deputy was injured Sunday during an operation to detain three people believed to have smuggled narcotics by boat into Ano Nuevo State Park, officials said. U.S. Coast Guard officials in the water early Sunday notified authorities representing the U.S. Immigration and Customs Enforcement's Homeland Security Investigations team and the San Mateo County Sheriff's Office that they were tracking a panga boat off the coast. 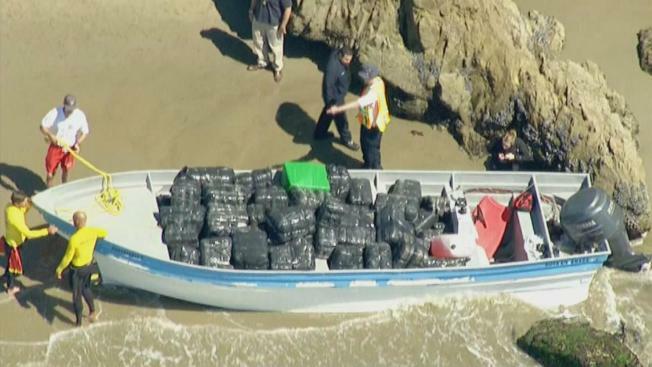 The vessel, which is believed to be connected to smuggling activity, landed at the state park in Pescadero before authorities seized the detainees, U.S. Immigration and Customs Enforcement spokesperson James Schwab said. The specifics of how the deputy was injured were not detailed, Detective Sal Zuno from the San Mateo County Sheriff's Office said. The deputy was transported to a hospital with non-life threatening injuries. An investigation into the deputy's injuries and the operation are ongoing, officials said.